Durable glossy vitreous enamel coating. 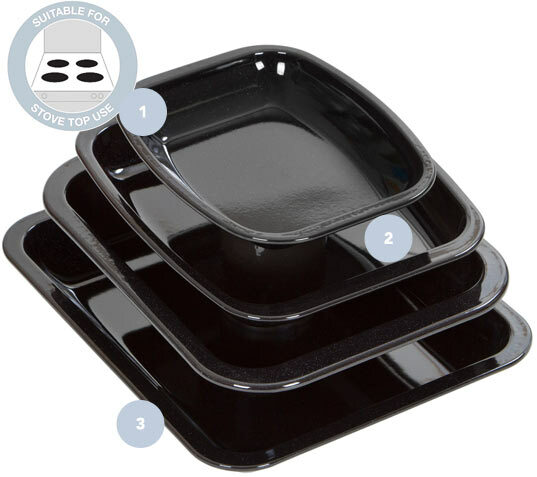 Oven safe to 230 degrees C, suitable for stove top cooking and safe for use with metal utensils. Will not stain or discolour. Lifetime guarantee. 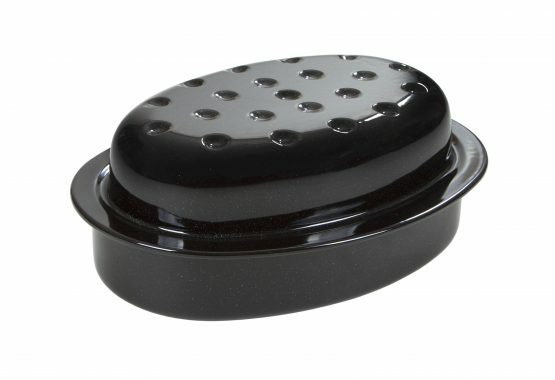 Self basting lid, to keep your roast moist and tender. Wham® Cook Enamel Range, a versatile, hardwearing and durable cooking solution for the everyday cook. As well as oven cooking, it is also suitable for: stovetops and even cooking directly over a campfire. Durable glossy vitreous enamel coating which will not stain or discolour and is suitable for use with metal utensils. Commonly enamelwear features hanging holes to hold the tin in place while being sprayed and put into the furnace. 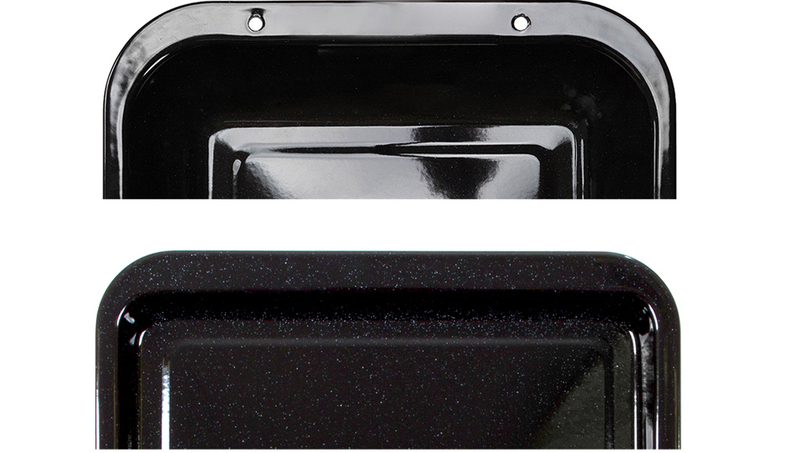 Although practical for production, it creates an area of metal that is hard to coat and is usually left open to the elements. In time water will cause rust to form inside the holes. To eradicate this problem we have developed a way to remove the holes altogether. Meaning there isn’t a risk of rust as long as the tin isn’t dropped, and the design of the tin isn’t compromised, which leaves a sleeker finished product. 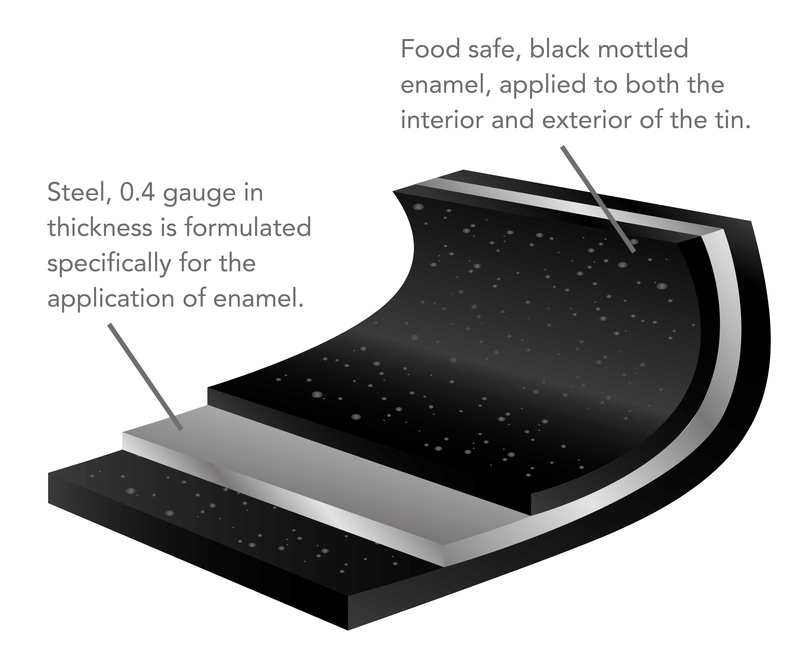 We are so confident in our enamelware that we offer a lifetime guarantee for the construction and enamel coating, when used in accordance to our care and use guidelines. What More UK offers a lifetime guarantee against faulty material and workmanship, when used under domestic conditions and in accordance to our care and maintenance details provided. In the event of a complaint please contact our customer services department. This guarantee does not affect your statutory rights. Before use, wash in hot soapy water and dry thoroughly. For best results, grease lightly before each use. If baking with a ingredients that have a high sugar content line tin with baking paper. Do not use at more than 230˚C/450˚F/Gas Mark 8. Do not use in a microwave. If any burnt food is left in the dish, soak in hot soapy water for a few minutes before cleaning. To clean, rinse in warm soapy water and wipe with a cloth. Nylon scourers may be used. Dishwasher safe, however to maintain your dish to the highest standards we recommend hand drying before storage. Handle with care and do not drop. If the enamel dish becomes chipped, discard immediately. Do not leave your dish unattended if using on a stove top.